Perfect Link Lines Game for Pocket PC and Windows, The game is very easy to play. You can move one ball at a time. 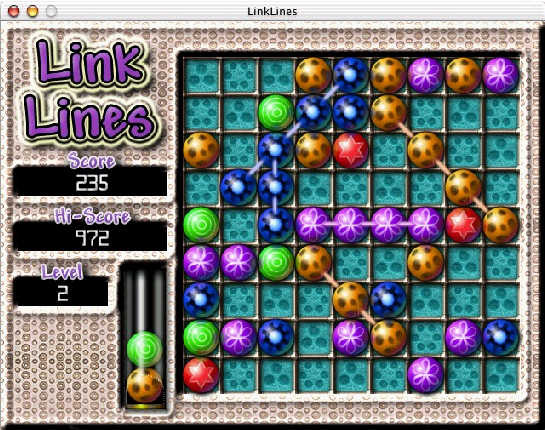 LinkLines is a remake of the classic Lines arcade puzzle game. The object of the game is to Link five balls of the same color to form a line in any direction. Create lines to stop the board from filling up! The game is presented in an updated format. You are given the chance to progress through various challenging levels. This is a bright and highly polished version of a classic game. LinkLines doesn't attempt to baffle you with features and bonuses, this is simply an addictive puzzle game! This is a fun and entertaining game for all ages. Quick reactions are not required for this game, there are no time limits or speed bonuses. You are free to ponder over each move. This game may appear simple but the subtle strategy required to reach the highest levels is most enjoyable. Zuma Deluxe Game - Control the stone frog idol of the ancient Zuma in this thrilling action puzzle Zuma Deluxe Game! Speedy Bubbles - A game of the classic Bubble Shooter kind. There are 4 games in one ! and Play Offline !